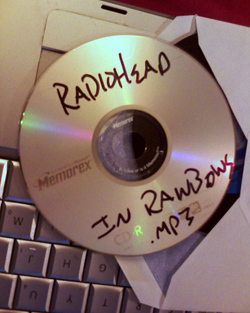 A blockbuster for Radiohead's "In Rainbows"? A British music site says the band has sold more than a million copies of its name-your-price album. The British music Web site Gigwise is reporting that Radiohead has sold 1.2 million digital copies of its latest album, "In Rainbows," since sales began on Tuesday. If true (and that might be a big "if"; see below), the number would be a blow-out, suggesting the wisdom of the band's decision to sell its wares directly to fans without the aid of a record label. The figure dwarfs first-week sales of Radiohead's recent studio albums. "Hail to the Thief," released in 2003, racked up 300,000 sales in its first week; "Amnesiac" managed 231,000 copies in 2001; and "Kid A" hit 207,000 in 2000. A million copies of "In Rainbow" would also beat recent big albums put out the traditional way. Bruce Springsteen's "Magic" hit No. 1 on the Billboard chart this week by selling just 335,000 copies. And remember the Kanye West vs. 50 Cent album showdown of last month? Mr. West's album "Graduation," one of the most highly anticipated releases of the year, won that fight with 957,000 in first-week sales, compared to 691,000 for Mr. Cent. Caveats galore: All numbers for traditional album sales here come from Nielsen Soundscan, which compiles sales data from retail locations and online digital stores. Gigwise says it got its "In Rainbows" number from "a source close to the band." It's hard to know what that means, because the band and its management have refused, so far, to disclose numbers, and they won't be providing any to Soundscan (and thus the album won't make the Billboard charts). Moreover, of course, Radiohead is allowing fans to pick their price for the album, and the band hasn't given any indication of what fans have been paying. If people are paying nothing or next to nothing, huge sales won't amount to much. Because the band isn't working with a record label, it gets to keep all that money. If it had sold its songs instead on iTunes, it would likely have seen less than $1.50 per album. Which means that if all these numbers are right -- 1.2 million units at $8 each -- Thom Yorke and his pals are seeing a lot of green right now.